↑ १.० १.१ Reena Shah (2006). 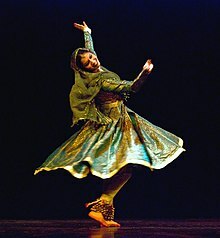 Movement in Stills: The Dance and Life of Kumudini Lakhia. Mapin. pp. 8. आइएसबिएन 978-81-88204-42-7. https://books.google.com/books?id=sSKU2DROHMgC&pg=PA8. ↑ James G. Lochtefeld (2002). The Illustrated Encyclopedia of Hinduism: A-M. The Rosen Publishing Group. pp. 358–359. आइएसबिएन 978-0-8239-3179-8. https://books.google.com/books?id=5kl0DYIjUPgC.